Specials good 4/11-4/14/2018 or while supplies last! days! We have Baby Back Ribs, Gyro Brats and Chili Cheese Brats on sale this week if you would like to get the grill out. If you want to stay inside, or feel you're forced to because of the weather, we also have Boneless Chuck Roasts for the crockpot or Chicken Tenders for the oven, or our Jacobs own Natural Casing Wieners or Mettwurst for the stovetop! 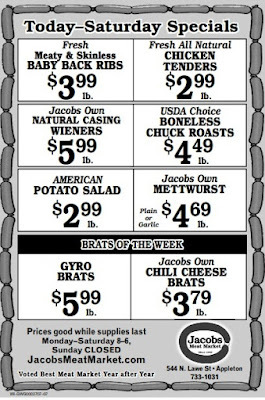 :) We also have our American Potato Salad at just $2.99lb this week! "The material we put into our stomachs is enough to have killed most of us sitting here, years ago. Red meat is awful, vegetables can be disastrous, and none of us realizes the germs in our drinking water. But there is one thing that is the most dangerous of all and we all eat it. Can anyone here tell me what lethal product I'm referring to?" "You,sir, in the first row, please give us your idea." The man in the front row lowered his head and said, "Wedding cake?"